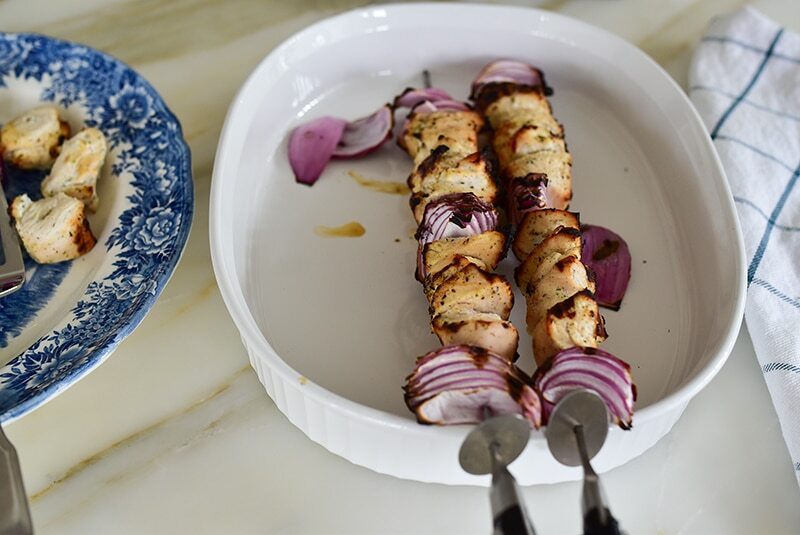 Grilled marinated chicken kebabs are a Lebanese tradition, served with toum garlic sauce or a simple seasoned yogurt sauce. I love this recipe because the chicken is so juicy and delicious from the flavorful yogurt marinade. Use long metal or wooden skewers--soaking the wooden skewers in water helps prevent them from catching fire over the grill flame. Be sure to plan ahead so the chicken can marinate for 8 to 24 hours. I often double this recipe...people eat it up and lots of it! The chicken is delicious served over rice, with salads like tabbouleh, fattoush, and Lebanese potato salad. 1. In a medium bowl, whisk the yogurt, onion, mint, salt, garlic, olive oil, and lemon juice. Add the chicken and stir to coat. Cover and refrigerate for at least 8 hours and up to one day. 2. Heat the grill to medium-high or, to broil in the oven, turn the broiler on medium. 3. Remove the chicken from the marinade and wipe off most of the marinade. 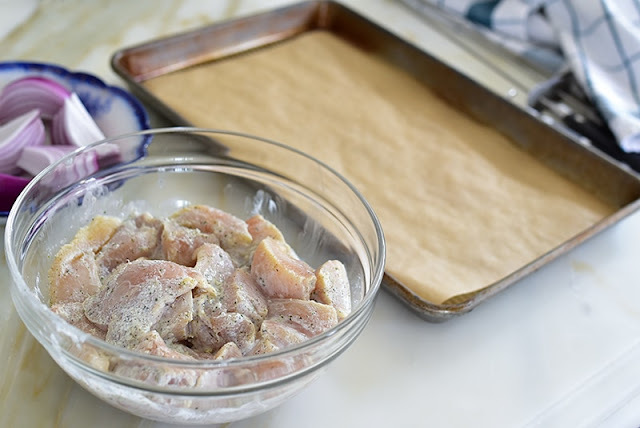 Place the chicken on a paper-towel lined sheet pan and pat dry with more paper towel. This is a messy deal, but worth it! 4. 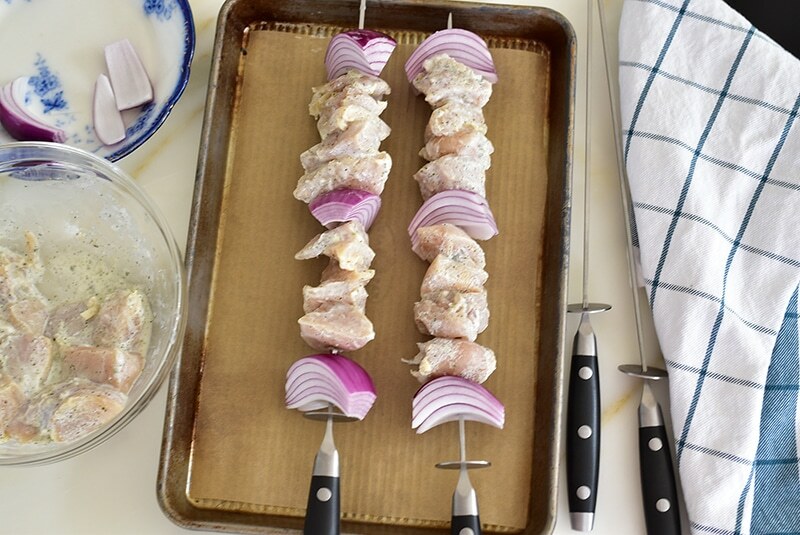 Thread skewers with chicken pieces and onion wedges. 5. 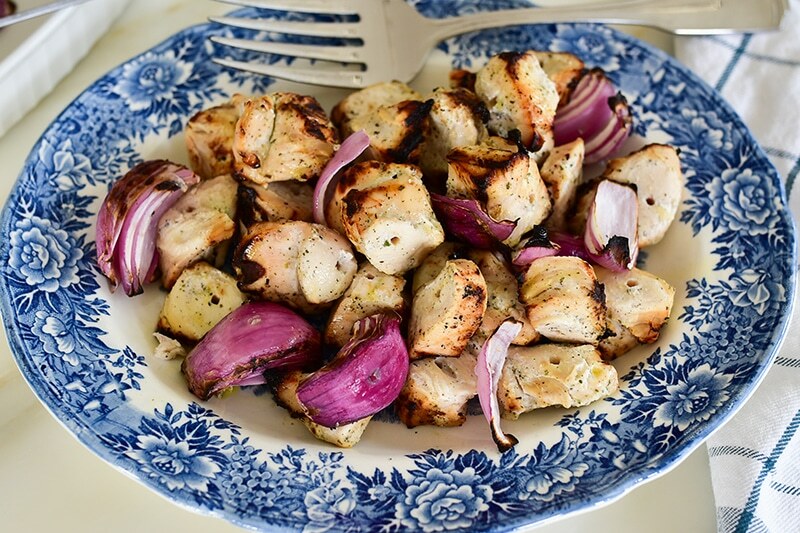 Grill the chicken over medium-high heat, turning the skewers for even cooking, for about 12 minutes or until the chicken is charred in places and cooked through. If you're broiling in the oven, be sure the rack isn't too close to the broiler to prevent burning. Broil for about 20 minutes, turning occasionally, until the chicken is cooked through and charred in places. 6. Use a large fork to push the cooked meat and onion off the skewers onto a large serving platter, and serve immediately.